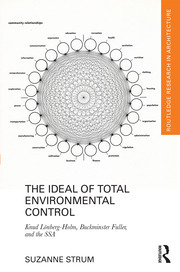 Suzanne Strum´s book - The Ideal of Total Environmental Control: Knud Lönberg-Holm, Buckminster Fuller and the SSA - was awarded a SAH-Mellon Author Award from the Society of Architectural Historians in 2017. This study explores some of the early definitions of ecological architecture in the United States as they developed within the context of Buckminster Fuller´s Structural Study Associates in the early 1930´s. Suzanne Strum approaches inquiry and teaching from an interdisciplinary and transnational perspective, integrating narratives and methodologies from the histories of technology, science, visual media, material culture, critical theory, cultural studies, economics and politics. Her work examines evolving meanings of technology, environmentalism and ecology. Trained as an architect at Columbia University Graduate School of Architecture, Planning and Preservation, she has a Ph.D from the Barcelona Architecture School, ETSAB of the Universitat Politècnica de Catalunya, UPC where she was also awarded a Master in Architecture and Urban Culture. She teaches in international architecture programs in Barcelona, Spain for the American University of Sharjah and for Calgary University. Previously, she was Co-director and Head of Studies of the Metropolis Master and Post Graduate Program in Architecture, a collaborative project between the UPC and the Centre of Contemporary Culture of Barcelona, and a lecturer in design and cultural studies at the Elisava School of Design and Engineering, Pompeu Fabra University. She has taught for Texas A & M, Carlton University, Clemson University, and Technological of Monterrey, and has participated in and led workshops and short courses for Central Saint Martins, Pratt Institute, Northeastern University and University of Pennsylvania. Among her other activities, she has worked on a wide range of exhibitions, research and publication projects as a collaborator at the Centre of Contemporary Culture of Barcelona; the Architects Association of Catalonia, COAC; the Museum of Contemprary Art of Barcelona, MACBA; The Mies van der Rohe Foundation; and for Fostering the Arts and Design Association, FAD. Her partnership, Demostudio is dedicated to renovation projects, new construction and environmental analysis. She is coeditor of Metropolis: Ciudades, redes, paisajes (GG, 2004) and the author of Barcelona: A Guide to Recent Architecture (Ellispsis 2001). European and American modern and contemporary design, architecture, landscape and urbanism.